At Uneecops, we believe in creating strategy based designs that convey your brand message with conviction and clarity. Uneecops follows a holistic approach to website development to create websites that not only look great but also perform. So from the start, we carefully consider your content strategy, information architecture and user pathways to market your site to your target audiences. Step one begins with understanding and analyzing your business requirements. The discovery phase plays a critical role in the overall website development lifecycle. We work with you to ensure that the websites we develop meet your strategic objectives. This is the most important phase of any web development project. In this phase, we do requirement assessment, examine competitors’ websites, define technical scope, set project timelines & milestones and document scope in detail. In this stage, our web development team focuses on creating a wireframe, select the right theme, color layout, features and other aspects of the website. During this stage, we incorporate various elements such as company logo, review your brand standards and determine overall visual feel. 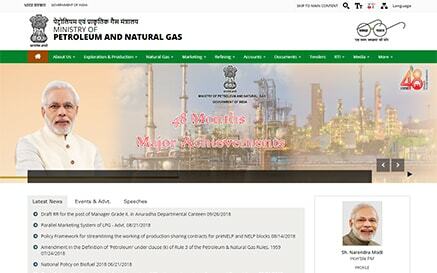 The idea is to give you the walkover of the website as how it will look like. This stage involves turning static designs to a working website. During this phase, it’s important to pay due attention to coding, graphical elements, frameworks and ensure the website is SEO optimized. Your new website is almost complete! During this phase, you will gain an access to the final product in a staging environment that only you and your team can test and access. We’ll walk you through each section of the website and wait for the final approval to release. Our website development cycle doesn’t conclude with delivering the final version of your application. We make sure that everybody is satisfied with the end product and is always prepared for opinion monitoring and continual maintenance. We use cutting-edge technology to create websites that increase user engagement. Being the pioneers in empowering leading organizations in the public and private sector, we have been instrumental in making the dream of E-Governance and digitization come true. We have helped people achieve this by following industry best practices and strong process oriented workflows. The office is headed by the development commissioner for handlooms. 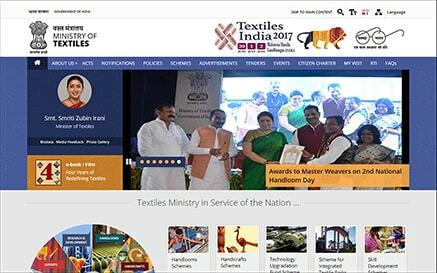 It administers various schemes for the promotion and development of the handlooms sector. 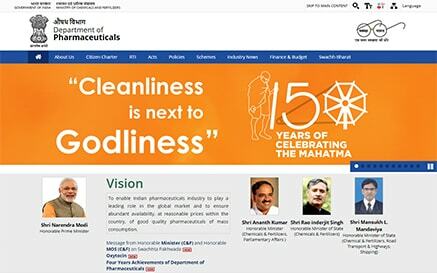 The Department of Pharmaceuticals focuses on drugs and pharmaceuticals sector development for catalyzing the growth of Pharma industry in India. The ministry deals in exploration and exploitation of petroleum resources, including natural gas and petroleum products, distribution, marketing and pricing. "It’s our pleasure to know that our work has been completed by your organization prior to the given period of time. Your project team has done this job in an impressive manner. I really want to congratulate you and your entire team on behalf of my department for this remarkable performance. I appreciate your work because the entire work was done by your team with 100% accuracy and before the given time slot." "Our pleasure to know that our work has been completed by your company prior to the given period of time and with accuracy. I really appreciate the efforts of your team members. All of them have worked day and night to make this project successful. Again, thanks for your stellar performance. Enjoy your recognition and keep up the good work." "The assignment of developing the “Seekho Aur Kamao” Portal has been completed by Uneecops satisfactorily, within the deadline set. The Uneecops team exceeded our expectations with the quality that they have delivered. I really want to congratulate the entire team." "We delightedly affirm our gratification towards the website and web application services being rendered by Uneecops and its competent team from the beginning to the accomplishment of the project. We are really satisfied with the entire project execution system, upkeep of schedules, the utmost quality & timely support and services provided by their team. We sincerely thank them for their continuous support & efforts." Air Force Station- Wing Cmdr.